Over the past year, I’ve progressed from making scarves to knitting a sweater, which I’m wearing now because I made it and I like to bring this to people’s attention at every possible moment, such as now. 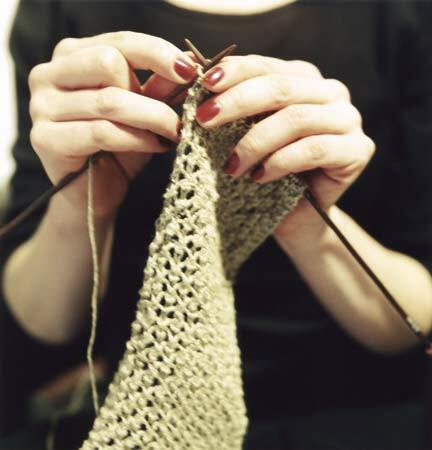 As I’ve grown more adept at knitting, I’ve noticed several similarities between it and writing. Stacie is right. Knitting is making loops. And writing is setting down words. Sometimes we writers forget this. It’s easy to get lost in pre-planning or character tangles. But it’s words. Just words. When I want to embark on a new knitting project I sometimes get overwhelmed by options. There are so many possibilities. But I usually choose a project based on my skill level, what I want to attempt next, and what sort of yarn I have on hand. Likewise, when you’re choosing a writing project it helps to choose something you’re passionate about and you feel (somewhat) comfortable creating. If omniscient point-of-view isn’t your thing don’t set yourself the task of writing that way. Write to your interests and your strengths. I get intimidated by knitting patterns. With all their shorthand: M1, K2TOG, it can seem as if you have to learn a new language. The same is true of writing. Reading craft books, with talk of denouement and inciting incidents, can seem daunting. Go back to the setting down of words. Don’t overthink the pattern. It’s your pattern. You get to choose. So if complicated scares you, stick with simple. Simple stories can be wonderful. When you mess up your knitting it helps to understand how you’ve messed up. I know I’m improving because I’ve gotten better at figuring out that I’ve made a purl six stitches back when I should have knit the stitch. Likewise, you know you’re improving as a writer when you can see when you’ve gone wrong and how. It’s a terribly useful and underrated skill. Every time I finish a new piece of knitting I want to show it to Stacie. And to anyone else in the vicinity, because I knit something! Because it’s done. Huzzah! This is not true of writing. Even if I want to share a first draft with someone I don’t because it usually needs another draft or three before anyone should read it. Novels take a lot of reworking. And editing and redrafting is as heartbreaking as ripping back rows and rows of freshly knit stitches. But novels are better for it. So too are your scarves and sweaters. Now come admire my sweater. Did I mention that I made it? Let us know if you find a way to knit and write at the same time! I love this: “Go back to the setting down of words. Don’t overthink the pattern. It’s your pattern. You get to choose. ” One word at a time, one knot at a time! I love your sweater! And your scarves and hats! So I can’t wait to read Landlord to a Ghost!